"I just love looking as if I know something. Look at me. Realize how under pressure. I just have hope now." At a keyboard with the aid of a facilitator, 24-year-old autistic Tyler Lazaruk tapped each letter one by one to form these words. His shocked parents looked on and cried with tears of joy and disbelief. "These are his first words to us ever. This is the first time in his life that he has expressed a thought," said Tyler's father Clarence Lazaruk. "It's in there, but he just can't get it out. This is obviously how he's going to do it." It's called facilitated communication and it's been used for some people with autism since the early 1990s. The method involves a facilitator who sits with a person with autism and holds his or her hand, wrist, arm or even simply touches a shoulder in order to help them type with a single digit. The theory is that the presence of a facilitator can help the person focus and target his or her neuromuscular abilities to type on the keyboard. It's controversial because critics say that the facilitator can be the one manipulating the typing rather than the autistic person. I just returned from the "Autism National Committee" annual meeting in Edmonton, Canada. I saw many people using facilitated communication, or FC, effectively in various ways. In some cases, I was a bit more skeptical. For sure, it is amazing to hear the thoughts of people whose outward appearance (including no eye contact, repetitive words and physical movement) can seem vacant or nonsensical to most of society. But FC was just one part of the conference. People who fall into all categories of the autism spectrum disorders arrived from all over North America to listen and learn from other people with autism. I followed up with an autistic woman named Amanda Baggs, whom we profiled earlier this year. Amanda communicates with a keyboard without a facilitator. (Watch Video) She and many other adults with autism came to speak about living on one's own without a guardian. This conference's tag line summed it up, "Autism: Living Life to the Fullest." This event did not focus on treating or curing autism, but rather discussing the best ways to live and understand one's autism. As for Tyler, he tried FC again the next day with a different facilitator. He had a far more difficult time, but was able to tap out with several typos, "Years of doing silly flaky behaviors are perhaps over." I couldn't help but ask his parents about the controversy. Did they believe these words came from their son? His father said, "Some people thought the facilitators were guiding the answers, and it's popularity has fallen off with the bad press. I'm telling you there is something to it." Do you or a loved one have any personal experiences with autism? How much emphasis is there on curing or treating autism vs. living with autism? Do you think autism is on the rise? I learned about FC briefly when I was getting my psych degree about 8 years ago. There was a case of a teenager who was facilitated into saying his father molested him for years, which turned out not to be true. The boy via his facilitator gave graphic detail of the molestations, which makes me wonder what was up with that facilitator. I also saw videos of facilitators clearly directing the person's hand where to go (e.g., a child or adult who has never attended school spell perfectly and know words he/she wouldn't have been taught how to read yet). Because of this, I'm skeptical of FC and consider it dangerous in some situations, but understand it could work in some cases. I have a 6-year-old son who is mildly autistic. We emphasis on living with autism, not finding a cure. We live each day, day-to-day, just trying to get through the everyday struggles. I do feel autism is on the rise. I do feel there is a link between autism and the metal mercury in childhood vaccines. I just think it is really strange how there has been a sudden increase in the cases of autism...there has to be some reason that these cases are coming out of the woodwork. My son used to talk and then stopped. We had tubes put in his ears and that did not help. I had my local AEA office come in and work with him two to three days a week in our home and still nothing...I was recommended to a wonderful preschool program which I believed it what turned my son and us around. I have a son with severe autism. He is now verbal, but many times he can write things that prior to seeing them on the computer or on paper, we would have never known that he thought that way. He has a blog of his own, it is http://charlieismyname.blogspot.com/ and he types what he is thinking at a particular moment. There are no instances of him typing "war and peace", but what comes out is what is in his head and we love seeing him talk even if what he is capable of saying out of his own lips is so limited and scripted. Facilitation can be done right and wrong. And when it is done very wrong, very bad things can happen. I do happen to know a woman with autism who used FC in an abuse case. The abuser denied everything. She had to pass rigorous testing showing that she really was the person typing, including testing where they tried to trick her. And she eventually learned to type without anyone touching her. She learned to spell from Sesame Street and observation. Just because someone makes accusations of abuse doesn't mean they are wrong. Her abuser did confess as soon as she saw her typing independently. I know many other people who speak their typed words out loud, or use speech to confirm whether people are understanding a word correctly. Contrary to popular belief, many FC users use very non-standard spelling that is easy to misunderstand. It is also possible for at least three kinds of wrong guidance to occur. A facilitator (usually a person using more support than they should) can guide the person to type ideas that the facilitator expects or wants the person to type. A facilitator can also help someone genuinely communicate, but have subtle resistance when a person tries to type a word that the person is not expecting or does not want. I learned about this not through typing but through an instance where my motor difficulties were stronger than usual and I needed help eating, so someone was not guiding my hand but providing support so I could move it more readily. But I could only move the fork to my mouth and back. I kept trying to scratch my nose, but the subtle resistance that happened when I did that made it impossible. The same thing can happen in FC. And the third is where the FC user actually actively seeks out cues from the facilitator. I remember someone saying she did that to cheat on tests, then got so much attention for being believed telepathic that she continued to claim that for awhile before admitting what she was doing. I know of a woman who sought out independence in typing because she could feel unwanted influence on her when someone was touching her. But despite these possible problems, most of the people I've met who use FC are obviously the ones communicating, have proven they were with oral language or message-passing or testing where they are shown something different from the facilitator. (Many people will also resist these things, feeling demeaned by the entire testing process.) This is not to say that influence is not an issue, but that from what I've seen it's quite often the real thing and should not be discounted (even when there are abuse accusations). I forgot to mention, I am not an FC user but I have something called hyperlexia. I learned to read around a year old. I read a field guide to birds, not just "easy" words. I had not been to school and nobody taught me to do this. This is incredibly common in autistic people, picking up words without being taught. Also, don't be too sure you know what the hands are doing in these videos. I have intermittent motor problems that are sometimes severe enough that I need physical help to type. It may look like guiding my arm. It is really pulling up my arm against massive resistance by my muscles, in order to free me up enough to move side to side or front to back of a keyboard instead of just up and down in one spot. When I push down even more than I'm already doing, the subtle change makes the person release a little so I can move downward, then pull my arm back up again so I can pick another letter. FC is often little different from the touches that can break people with movement disorders out of freezing or repetitive motions. It is more controversial because it involves communication. Autism is not on the rise. There is no hard data to support such notion. Put in a historical context, the diagnostic criteria has continued to widen since its establishment. The numbers of autism not only reflect this widening, but also increased awareness and better screening and diagnostic tools. As for facilitated communication, it is a junk treatment approach. Not only does it promote dependence, but its reliance on a facilitator is suspicious, and has cause serious legal trouble for some unfortunate families. As with anything, the potential exists for fraud. But properly done, and properly understood, FC is nothing more than the minimum tactile-sensory support necessary for an individual to overcome apraxic barriers to keyboard use, or more generally, to pointing. 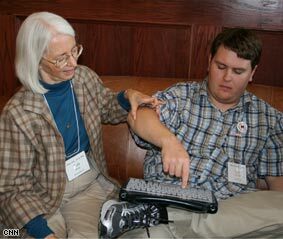 It's very much in the individual's interest to be able to type without tactile support, because with increasing independence in life-activities s/he will be in situations in which s/he'll need to be able to communicate spontaneously and without someone available to provide tactile support. I was at the AutCom conference in Edmonton. Many, if not most, of the folks there who were communicating via keyboard were doing so without tactile support, at least some of the time. Others were doing so with really minimal tactile input, such as constant pressure on a shoulder. FC was misrepresented as some sort of "miracle cure" in the 1990s -- and then completely trashed on that basis. It is *not* a "miracle cure". It is not even a miracle. It won't enable an individual without literacy to use an alphabetic keyboard meaningfully. It won't enable an individual without receptive verbal ability (the ability to understand *others'* speech) to communicate with other people who are using speech. All it is, properly understood, is a means of overcoming specific apraxic barriers. In individuals with literacy and receptive speech, this enables interactive communication via keyboard. Interesting. I also know of a woman who was abused and testified at court using FC. The court threw out the case stating that FC was not reliable. Turns out, the father later confessed to abuse. Today, that girl does not have access to any device. Just think about what she might have to say. It's not just about FC. Not all people require the same levels of prompting -- certainly there are so many autisitc individuals who type independently now, but who had to learn HOW to communicate using it. I hope your program will not be about just FC. I hope it will about autistic people who are not heard, period, by people who don't care to listen to their struggles. I was a skeptic too, way back in 1992, but then a young child allowed me to hold their hand and I felt the pull to the letter board. It's truly been a roller coaster ride of emotions ever since. I am not the one in the picture, but I was there to help Tyler get started. Seeing his parents' joy makes the turmoil of the past 15 years all worthwhile. There is no denting that the incident occurred. The facilitator may have quide the communication or the communication was intentionally false. Generally speaking people with autism are extremly honest but it is possible that the communication was falseintentionally. Either senario would not justify the discontinuation of using FC. If every so called "normal" person would have to stop speaking when an untruthv was uttered we would have a silent world. The techniques and training of facilitators has advanced considerably since the times of contoversy. People can learn without being taught. Tyler's second day had more typos because he was in a state of high anxiety. When that happens it is extremely difficult to focus. Considering the state of his anxiety he did very well. I just wanted to add that they have other FC's out there too. Ones with pictures instead of letters, that help people who are a little farther on the spectrum to communicate. It's difficult to get them though because they are very expensive and it is really difficult to convince your insurance company to help pay for it. I know because my brother is 19, has autism, and we have been trying to get our insurance company to help us out with one for 4 years! Even with doctors, SLP, and teacher's documenting his use, and improvement with the device. I agree with Adam in that there is no evidence that Autism is on the rise. The difference in diagnostic criteria between the DSM III and the DSM IV-TR is amazing, and much more specific. There is absolutely no evidence that mercury causes Autism. Autism is believed to be a congenital neuro-psychological disorder, there is no way immunizing a baby against disease is going to make them all of a sudden be Autistic, or have Autistic tendencies. Also, there is a seperate diagnostic category for children who were normally developing and then regress. Finally, I would like to note that it upsets me when people spend so much time blaming mercury and other such things for Autism. If you or a loved one has Autism, does it really matter what caused it? The experts, real scientists, are working on that, perhaps we should be more focused on our lives with people with Autism and making them the best that they can possibly be. In recent days our family has been dealing with how our son's Autism (and the resulting complications to our lifestyle) is perceived by others. Our focus is on living with Autism, but that doesn't stop us from working towards making our son more able. He is non-verbal and he has grown from a cute little boy into a teenager. The situation, obviously, has changed and we are adjusting to how his behavior is interpreted by others. From the outside, I'm sure it looks easy. We do the best we can to maintain a balance and to not seem overwhelmed. This situation is a balancing act...we have to allow him to be the person he is (warts and all, as it were) and still help him to learn how to navigate the world of "neurotypical" people. His use of sign language is limited, his writing skills are improving (but he cannot yet write a sentence) and he communicates his needs and wants in easily decipherable ways. How well would FC work for him? Probably not well at all...would we try it? Perhaps. Would we like to see a cure? All these articles about how some kids are "cured" by diets...maybe that's more for the parents than for the children, but who are we to judge? Yes, a cure would be nice...perhaps a reason, a cause would be infinitely better. We have ceased to wonder "why" and focus on how amazing he is and how much he has brought to our lives that we didn't have before: an ever-deepening well of patience and wisdom for his parents and, for his older brother and future legal guardian, compassion and understanding that, under other circumstances, might not have blossomed as they have. Our son -our autistic son- has allowed us to discover our true priorities...we are a family...that fact takes precedence over our jobs and maybe, just maybe, it would have been very different if our child's had not been autistic. Who knows? We have learned to listen, to observe, to reach out, to understand and we believe that he is doing the same...the happiest child in school, they've told us...a joy to have in class...the most contagious laughter. Who is to say how many people's lives he has changed and will change because he is who he is? Thank you so much for covering Autcom's conference. I'm the father of a nine-year-old with autism, and strongly support Autcom's goals. What I especially appreciate about your reporting is that you are helping shatter popular misconceptions about autism and so-called mental retardation. That issue is larger than the FC controversy, albeit partly related to it. My son still doesn't talk much, but has very advanced language. Like many kids, he learned how to read from Sesame Street; unlike most kids, his first use of language was by pointing at a word to show what he wanted. He still points at words all by himself, and also uses FC for sentences, and he is working on greater and greater independence. I've blogged about his experiences and my thoughts on FC. But again, autism rights is a bigger issue than FC. We need to listen to and respect the rights of people with autism. We must try to understand autism from the inside out, i.e., via the accounts of autistic people themselves, and integrate these insights with the best scientific research. Along those lines, this is an excellent essay by a psychology professor whose son has nonverbal autism. I agree with the author that not all aspects of autism are maladaptive. Some are simply neutral, and some are genuine gifts. We have a lot to learn, and thank you again for helping shed light on autism with your insightful reporting. Autism is not a disease, it is a disability. Autism is not listed anywhere as being a "disease." As with any disability, we need to accomodate the disabling aspects while acknowledging and building upon the abling ones. Autistic people, as I said in my keynote speech at AutCom this year, are different AND equal -- therefore worthy of the supports they need to contribute to society as they are. I have a son who was diagnosed at 18 months of age. I've been through the fear, the "window," the desperate "early intervention" stage. The fact is, all autistic people progress from where-ever they begin. All autistics learn and mature. As the founder of The Autism Acceptance Project, I know many autistic adults who have shared similar characteristics with my son as children -- late talkers, or some who never developed speech but did much much later, or communicate on computers. I have nothing but deep gratitude for the autistic individuals who face constant adversity and submission by a system/society that does not understand them. It is because of meeting many autistic and disabled individuals, that I've learned to reframe my expectations and enjoy the unique traits and characteristics of my son -- without stress and worry. Isn't the main point that we all go on living? I don't see how some of our so-called "advocacy" is furthering the life-model or how we can live our best lives with autism. Adam, my son, actually gave me the gift of life, and of learning how it is to live, and what it means to be human. Such a large gift from such a young child. Proud Mother of autistic son, Adam. Is this 2007? Am I hearing this misinformation spouted by CNN? Doesn't any journalist have access to www.google.com or bother to use it anymore? ABSTRACT. We evaluated the authorship of messages produced through facilitated communication by 7 adults with moderate or severe mental retardation and their facilitators. The clients had been reported to be communicating fluently through facilitated communication. We controlled the facilitators' access to information to be communicated in two evaluation formats, naming pictures and describing activities. In both formats we conducted three conditions: (a) the facilitator and client had access to the same information, (b) the facilitator did not have access to the picture or activity, and (c) the facilitator was given false information about the picture or activity. The results showed that the clients typed the correct answer only when the facilitator had access to the same information, never typed the correct answer when the facilitator had no information or false information, and typed the picture or activity presented to the facilitator when it was different from the one experienced by the client. These results provide unequivocal evidence for facilitator control of typing during facilitated communication. I read recently that Vitamin D may have an affect for people with autism. There was suppose to be a symposium on Vitamin D, I think sometime this past September and I wonder if the topic was approached? I was researching Vitamin D supplementation for chronic fatigue; is there a chance that the findings of the symposium could be discussed as well as the connection of Vitamin D to autism and fatigue? Sorry, but I don't buy into the conclusion that the study cited above provides "unequivocal evidence for facilitator control of typing during facilitated communication". This research design has been used a number of times, despite careful study that has shown that the conditions of such a study are particularly difficult for individuals with autism. Essentially, they're being set up for failure. Nevertheless, there are FC users who have learned to "beat" that design, but found that it took lots and lots of practice and an unthreatening environment in order to do so. If you thought you could lose your opportunity to communicate if you were to fail, you'd feel pretty darned threatened, too. If people observe FC users closely, it becomes ludicrous to think that the facilitator can be "controlling" all that they write. Some FC users are barely touched by the facilitator, yet they write amazing, unique, lengthy messages. Just try touching a friend on the elbow or shoulder and see if you can make them write whole sentences or paragraphs of your choosing. Ridiculous! What would your life be without communication? The importance cannot be over-stated. We still have so much to learn about autism--and about facilitated communication. We need to proceed with care and an open mind. It's a complicated issue, and it would be rash to prejudge any person's communication without first getting to know him or her in a real-life setting. For instance, if my son is upset, and says why via FC, and gets his need met, and isn't upset any longer, that's good evidence. Even better, when he relays true information that the person facilitating doesn't know, it's clear that the words are his own. The experimental models of the many studies like the one cited by MikeBTexas are flawed. They are too weak to prove anything about individuals other than those directly studied. Touting them as proof of categorical ineffectiveness of FC amounts to junk science. The rush in the mid-1990s to produce studies purporting to prove FC categorically ineffective was motivated by fear of the possibility of false accusations being made via FC -- but in the process, public opinion was turned against the reasoned and legitimate use of FC as a means of overcoming apraxia leading to independent typing. And that denied many individuals an avenue of access to reliable and respected communication. The trashing of FC did far more damage than good. As an attendee of the 2007 AutCom conference Chris Gajilan covered, though, I want to say that the conference was about much much more than FC. There were breakout sessions on employment, adult relationships and marriage, post-secondary education and transitions into and from it, alternatives to guardianship, and more. There were drama and mime performances by autistic performers. There was lively discussion at meals and between sessions -- among parents, professionals, and folks on the spectrum *as equals*, which is all too rare in mainstream autism conferences. Chris's team filmed much of this; I would really like to read her impressions of these other aspects of the conference, and not have them eclipsed by sole focus on FC(and endless attacks on it, by those condemned to attempt to repeat history because they have not learned from it). The National Autism Committee Conference brought an incredible representation of people on the Autism spectrum together to share, instruct, entertain, and encourage. It was great to have Chris and her crew from CNN there. My own life journey with my son is echoed in other postings here. But I will add that 15 years of FC use as he guides the direction of his marvelous life provides sufficient validation to all who know him. at an extreme social disadvantage. the Myth of the Person Alone". Wow, first of all theres a huge diference between autism and aspbergers. Asbergers is caused by serously being tormeted by viture of being highly gifted. I belive that because it diganosed later and I am highly gifted so I can say that well, we are diferent, and humans dislike diference. Full blown austim really is just another form of retardation and so fasictated comictation wont work. Asbergers just give them a heck of a lot of consuling and put them with other gifted people, then maybe thell start talking. I know kids who were barely verbel went to camps for gifted kids, well they were soical there. Serously many gifted kids are naturly shy, andwe are basicly bullyed for our intellegve from the point it becomes overous. I mean 1/2 the symtoms are symptoms of other illness or stuff like stands on toes, wears clothes inside out as seams bother us, those are just called hypersentivies people! Some people may have Autism, but it is not such a big issue, there may indeed be a few gifted people with it, maybe severe asbergers, but we really should put the effort into somehting like oh, maybe cancer, obesity, as opposed to trying to dianose every gifted kid with social and maybe a few accamdic issues with a real illness, its like adhd, finished classwork early. World just accept us and we will do great things, do not accept us and we do not write symphonies and e=mc2. Sharisa Kochmeister, who was at the conference, reported passing that exact same kind of testing before her typing became independent. Why have there been no new comments posted in the past week? I know of several people who have written in. There is plenty of published evidence of the efficacy of FC. There are also many individuals who needed facilitation to express their thoughts for the first time, who have learned (often after many years) to type independently. How can the FC naysayers continue to ignore those people? Message-passing tests in the hands of facilitated communications (FC) advocates are shams, fakes, and lies. In a genuine message-passing test, the person with autism is shown a common object out of view of the facilitator (who is also not told what the item might be). The facilitator and person with autism then attempt to name the object through FC. They invariably fail to produce accurate answers. In almost 20 years of testing, reliable communication of this type has never been demonstrated in non-verbal people with autism using FC. However, when the facilitator is shown the object after the failed test, FC suddenly seems to work, demonstrating that the facilitator is clearly the author of the communication. Doug Biklen, FCâ€™s biggest advocate in the US, says people with autism have â€œword-finding problems.â€� What a crock. Why do they always get the answers right when the facilitator sees the item? Perhaps itâ€™s ESP, as Autcom speaker Anne Donnellan believes. Maybe they get the answers via â€œsubspaceâ€� through â€œQuantum Xrroid Consciousness,â€� as Autcom Conference Chair Gail Gillingham Wylie might suggest. Of course, Gillingham would charge them $1000 for the information. When FC advocates talk about â€œmessage-passingâ€� they are talking about a sham version of the valid test. In one dishonest version, described in Facilitated Communication literature, the facilitator and the person with autism are to jointly choose a common object, â€œdiscussâ€� it, and practice typing its name through FC. Then, an observer is brought in and asked to figure out what is being communicated through FC. That is, the facilitator and the person with autism type something once again after they practiced it over and overâ€”and we are supposed to believe that valid, independent communication has taken place! How does this possibly show that the person with autism is typing independently? And these people are shameless. They have so little methodological credibility of their own, they must steal it from others. This is the only way for them. In almost 20 years, they have yet to produce methodological valid evidence that FC is a reliable and valid communication technique. For something as good as FC is supposed to be, there should be dozens and dozens of good studies showing it works. It should be almost effortless to show it works. In reality, the few studies that seem to support FC are so convoluted and confounded that they are excellent examples of what not to do. When FC advocates invoke applied behavior analysis (ABA), saying that practice is needed for maintenance and generalization of FC, they are engaged in a cover-up. They canâ€™t get valid communication from real double-blind tests, and have to fake it by practicing the trick beforehand. In a fake FC double-blind identification testâ€”this one a standard example in FC workshops--the facilitator and person with autism â€œpracticeâ€� naming items from a set of about 15 words or pictures printed on cards. Later, in the â€œcommunications test,â€� the same set of cards is used. The person with autism, but not the facilitator, is shown the cards in random order, and FC is used to name the picture or word. After each trial, the card is shown to the facilitator as â€œimmediate feedbackâ€� on accuracy, just like the ABA people say to do. That card is set aside, and the next card is attempted (and so on). Voila! FC produces more correct answers than incorrect, especially as things get going. Of course, that would happen by elimination alone. Once each card is shown to the facilitator, it is gone from the list and never to be mentioned again. As the stack is exhausted, the answers are more likely to be correct. The last card is always correct unless the facilitator has forgotten something. The scam is worse than that. The first few trials, always the most inaccurate, are thrown out as â€œwarm ups.â€� That leaves only the later trials, more likely to be correct by elimination. And, if the word typed through FC is â€œsemantically relatedâ€� to the picture or word on that card, it is counted as being correct. Thus, â€œmeatâ€� can count for â€œsandwichâ€� and â€œmilkâ€� can count for â€œcow.â€� Just to gin up the fake total even more, if a correct answer occurs a trial or two later due to "cognitive processing delays," it can be counted as correct. That is, the facilitator doesnâ€™t even have to get the answers right to be counted as being right. The answer only has to be close, and not even on the same question! So, people who can write poetry and philosophy through FC, and give speeches at conferences, arenâ€™t even expected to get the answers right on a picture-naming test. So much for â€œassuming competence,â€� as the FC advocates so often say. The ABA people, to their genuine credit, do the test right. They use a randomly selected subset of a large number of items so that the facilitator canâ€™t just guess, and they do not reveal the answers until the end so that accuracy by elimination (card-counting) is eliminated. When the test is done honestly, FC never produces the right answers. Donâ€™t be fooled when FC advocates talk about validity. Their so-called â€œvalidity testsâ€� have fewer controls for cheating than a childrenâ€™s party game. We have to wonder why Sanjay Gupta and his staff are so eager to promote this pseudoscience. Message-passing tests in the hands of facilitated communications (FC) advocates are shams, fakes, and lies. In a genuine message-passing test, the person with autism is shown a common object out of view of the facilitator (who is also not told what the item might be). The facilitator and person with autism then attempt to name the object through FC. They invariably fail to produce accurate answers. In almost 20 years of testing, reliable communication of this type has never been demonstrated in non-verbal people with autism using FC. However, when the facilitator is shown the object after the failed test, FC suddenly seems to work, demonstrating that the facilitator is clearly the author of the communication. Doug Biklen, FC's biggest advocate in the US, says people with autism have "word-finding problems." What a crock. Why do they always get the answers right when the facilitator sees the item? Perhaps it's ESP, as Autcom speaker Anne Donnellan believes. Maybe they get the answers via "subspace" through "Quantum Xrroid Consciousness," as Autcom Conference Chair Gail Gillingham Wylie might suggest. Of course, Gillingham would charge them $1000 for the information. When FC advocates talk about "message-passing" they are talking about a sham version of the valid test. In one dishonest version, described in facilitated communication institute literature, the facilitator and the person with autism are to jointly choose a common object, "discuss" it, and practice typing its name through FC. Then, an observer is brought in and asked to figure out what is being communicated through FC. That is, the facilitator and the person with autism type something once again after they practiced it over and over--and we are supposed to believe that valid, independent communication has taken place! How does this possibly show that the person with autism is typing independently? And these people are shameless. They have so little methodological credibility of their own, they must steal it from others. This is the only way for them. In almost 20 years, they have yet to produce methodologically valid evidence that FC is a reliable and valid communication technique. For something as good as FC is supposed to be, there should be dozens and dozens of good studies showing it works. It should be almost effortless to show it works. In reality, the few studies that seem to support FC are so convoluted and confounded that they are excellent examples of what not to do. When FC advocates invoke applied behavior analysis (ABA), saying that practice is needed for maintenance and generalization of FC, they are engaged in a cover-up. They can't get valid communication from real double-blind tests, and have to fake it by practicing the trick beforehand. In a fake FC double-blind identification test--this one a standard example presented in FC workshops--the facilitator and person with autism "practice" naming items from a set of about 15 words or pictures printed on cards. Later, in the "communications test," the same set of cards is used. The person with autism, but not the facilitator, is shown the cards in random order, and FC is used to name the picture or word. After each trial, the card is shown to the facilitator as "immediate feedback" on accuracy, just like the ABA people say to do. That card is set aside, and the next card is attempted (and so on). Voila! FC produces more correct answers than incorrect, especially as things get going. Of course, that would happen by elimination alone. Once each card is shown to the facilitator, it is gone from the list and never to be mentioned again. As the stack is exhausted, the answers are more likely to be correct. The last card is always correct unless the facilitator has forgotten something. The scam is worse than that. The first few trials, always the most inaccurate, are thrown out as "warm ups." That leaves only the later trials, more likely to be correct by elimination. And, if the word typed through FC is "semantically related" to the picture or word on that card, it is counted as being correct. Thus, "meat" can count for "sandwich" and "milk" can count for "cow." Just to gin up the fake total even more, if a correct answer occurs a trial or two later due to "cognitive processing delays," it can be counted as correct. That is, the facilitator doesn't even have to get the answers right to be counted as being right. The answer only has to be close, and not even on the same question! So, people who can write poetry and philosophy through FC, and give speeches at conferences, aren't even expected to get the answers right on a picture-naming test. So much for "assuming competence," as the FC advocates so often say. The ABA people, to their genuine credit, do the test right. They use a randomly selected subset of a large number of items so that the facilitator can't just guess, and they do not reveal the answers until the end so that accuracy by elimination (card-counting) is eliminated. When the test is done honestly, FC never produces the right answers. Don't be fooled when FC advocates talk about validity. Their so-called "validity tests" have fewer controls for cheating than a children's party game. We have to wonder why Sanjay Gupta and his staff are so eager to promote this pseudoscience. I don't get it. As a person who attended the AutCom conference, it was not about FC. It was about autistic identity and enablement. AAC/IT has moved so far beyond those FC days. So many people I know today with all kinds of disabilities and motor planning issues had to be taught with OT support, how to type and how to use a device. The gulf between FC and what Stephen Hawking does is vast. Hawking is actually speaking independently using computerized augmentative communications devices designed and built by people who legitimately want to help him to express himself. The promoters of FC are interested in putting words into the mouths of helpless people using a fake augmentative communication technique. It is a damn fine thing that none of the FC people got to Hawking first. As for Autcom, the conference may not have been all about FC, but the blog is largely about it. Talks and panels this year and in previous years are given using FC. FC has been the subject of sessions. FC was being done in the halls and breakout rooms of the Chateau Nova Hotel in Edmonton a week and a half ago. The Autcom newsletter is not all about FC, only a lot about it. It is hardly a mystery why. Autcom is a fringe, anti-science group grabbing for all the attention it can get during this period of autism mania. FC is making a comeback, and if Time/Warner is eager to promote it and give Autcom free piggy-back publicity, Autcom will take it in a second. There are very certainly sincere people in Autcom who want to help others lead full, happy lives. All that is overshadowed by the quackery and tin-foil-hat beliefs of some of Autcom's leadership and supporters. The bigger mystery is why a University of Michigan trained neurosurgeon, Sanjay Gupta, now at prestigious Emory University, is sending his staff all over North America to promote FC pseudoscience and profile FC apologists. I also attended a session about inclusion and one about movement disorders. One of my friends gave a presentation on what it's like to grow up autistic, and she and her husband also sat in on the marriage panel. Other people I know did sessions on guardianship and advocacy. I'm not going to get into the issue of validity in FC; to my knowledge, there is just as much scientific evidence FOR as there is AGAINST, and that's as far as I'm willing to go at the moment. Suffice to say, I know several people who communicate via typing and have met a number who use facilitation, and I do not doubt that it is all the autistic person communicating. Having said that, AutCom, for me, was all about the people I spent time with while I was there, and I am very glad I went. Wow! "What a load of nonsense" has a real chip on his shoulder! I have read FC research and it sure doesn't bear much resemblance to Nonsense's description. As a Speech-Language Pathologist who has worked with people on the spectrum for almost 20 years, I have found it fascinating to think about how non-speaking individuals seem to have learned language as compared to the way more typical persons do. Most of us learn through experience/interaction/ trial and error. Those who communicate through writing apparently learn primarily through observation. Why would we expect their expressive language skills to be just like "ours"? Their brains are different from "typical" brains....not damaged or inferior, but different. They seem to learn differently--sometimes much more efficiently--and they often have gifts we "NT's don't have. In re: to "message passing" (telling an uninformed person something that one has seen/heard/done), most toddlers are coached/prompted to do so over and over, i.e., "tell Daddy where we went/who we saw/ what we did today". Most young children need help coming up with an answer. Parents/teachers, etc. tend to coach them through this over and over and over. Non-speaking individuals do not have that experience as young children. Teaching them to pass along information to an uninformed facilitator is not cheating. It is simply "teaching". "Message passing" is a skill most people with autism need to be taught. In a study by Cardinal, et.al., which was published in the journal Mental Retardation, the researchers found that with practice, students learned to tell an uninformed facilitator a word they'd been shown on a card. A card was randomly chosen from 100 (not 15) cards. It was shown to the student, who practiced writing it with facilitator #1, then facilitator #2 entered the room and asked the student what the word was. Most of the 43 subjects could not do that on the first trial. With practice over a 6-wk. period, 73% improved significantly--some truly mastering the skill. Only perfectly spelled words were considered as correct answers--associated words were not accepted. Other studies have shown that FC users were able to give specific answers to complex questions that the "uninformed" facilitator couldn't be expected to know or guess. Others have done well with computer games when the facilitator couldn't see the questions on the screen. The research is out there. Check it out. But FC shouldn't be all about tests -- unless you consider life to be a test. Many FC Users have improved their quality of life enormously, in inclusive school, work, and community settings. That's where you need to look. Going on a slightly different tangent, I would like to comment on a phenomenon I have observed over the past years that I find both interesting and significant. When I first attended an Autcom gathering, I thought the participants with autism - and there were many - were able to teach us a lot, but seemed to be overwhelmingly focused on their own personal situation, without much regard for that of others. Fast forward to 2007, and what I see is a fantastic group of brilliant, compassionate individuals who are now advocating for their friends with autism who may not be able to speak for themselves. And they are doing a truly commendable job! How sad it seems that these people who have overcome incredible odds to reach the point where they are able to travel far from their homes, step far outside their comfort zones, and speak up strongly - not so much for what they themselves need or want in their lives, but more so for their silent friends at home, who are so terribly misunderstood - are then dismissed as what? Frauds? Liars? How dare we ignore what they are telling us! Many of them also started out unable to speak or type, needing full physical support to accomplish just about everything in their lives. They have worked hard, have come a long way, and deserve our highest respect. We should be listening to their every word - whether spoken or typed. A magnificent phenomenon is occurring; however, I feel the wrong questions have been asked. Concerns have revolved around 'who' the information is emanating from, rather than the 'relationship' that is occurring that allows for the information to be transcribed. How does this relationship occur? What are we to learn from it? Does it help the person with severe autism understand our language system? Does it help us understand their system of direct knowing? Does forming a sympathetic resonance with the facilitator help the person typing calm down his own chaotic flow? Are brainwaves of both parties entrained to the same frequency? Does this synchronization serve as a catalyst for free flowing thought to organize itself for conscious expression? Does this relationship assist in accessing information from the subconscious, the knowledge base of others, and the universal field of thought? Is true independence possible or will some level of partnership remain necessary? I do believe facilitated communication has many benefits or I would not use it. Most important, the person typing appears to enjoy it. Whether I provide physical support, hold the communication device, or just stay in close proximity to the person who is typing, my students have lead me to believe that it relaxes them. Unconditional love, trust, and expectation of competence may open the channel for this seemingly subconscious blending. A sense balance seems to be created as we move in tandem and establish a rhythm. It is as if disengaged channels are suddenly all on the same wavelength; submerged in free flowing thoughts. We are in flow! My perception is: I am part of them and they are part of me. I am thankful! Serving as a facilitator has expanded the parameters of my consciousness. It has been a remarkable gift. I am hopeful others will step forward to share their experiences. A paradigm shift of this magnitude demands it! I canâ€™t believe this cruel farce is raising its ugly head again. In tests of FC in the past the IQ of the autistic person matched the IQ of the facilitator. There is a very easy test to see if this is really what it claims to be. Blindfold the â€œfacilitatorâ€�. If the facilitator is only â€œproviding supportâ€� then there is no need for him/her to see the keyboard or even hear the questions. I predict that if anyone ever agrees to such a test that the results will be absolute gibberish. Please people. If you want to do research into autism lets stick to reality here and not victimize the autistic and their families. CNN should be ashamed of itself for reporting this scam as if it had any scientific merit. I'm very sorry, but I find the level of gullibility here incredibly frightening. If someone could cite a properly controlled study in which the facilitator was either a) unable to see the keyboard (or other device) used by the subject, or b) was kept from knowing what questions were being asked of the subject, I'd be less skeptical. But, as most FC practioners know, but none will admit, no test has been successful with either of those constraints. We have autism in our family, and I detest the FC community for victimizing the desperate loved ones of their subjects. HAVE YOU NO SHAME? And more scorn must be directed at CNN for its portrayal of a multiply-debunked scam as some blessed phenomena. What a terrible shame that this is still going on, after being debunked so thoroughly and so long ago. CNN should be *ashamed of itself* for giving space and credibility to practices that prey on the needs and hopes of desperate parents. A very simple and elegant test of facilitated communications was done at least a decade ago. In this test, the autistic person and the facilitator were shown different target pictures of common objects. This was done on a simple table with a partition running down the center so that the facilitator could only see their target picture and the autistic individual could see theirs. The objects in the pictures were common items like chairs, cars, books, houses and so on. When the pictures shown to the subject and to the facilitator were identical, facilitated communication reported the correct object. When the objects shown to the facilitator was different from that shown to the subject, facilitated communications **ALWAYS** reported the object shown to the facilitator and **NEVER** that shown to the autistic subject. This proves, without the slightest doubt, that all of the information derived from facilitated communications comes **ENTIRELY** from the facilitator. No statiscs were needed-- the results were 100% consistent over a variety of subjects, facilitators, communications devices and target objects. If you doubt these facts, please try such a test yourself. Most supporters of the process contend that physical support provides assistance with movement difficulties and that it may also afford emotional support. They usually claim the information is coming entirely from the person typing. Supporters often say the nonverbal person has been gleaning information from his environment even if he has not been formally taught literacy skills. The Detractors believe that the facilitator is leading the typist, possibly subconsciously. Many of the students I have worked with easily make the transition form arm or wrist support to hitting the keys on their own, provided I am holding the communication device, have some physical contact, and/or remain in close proximity. Whether I provide arm support or not, my experience has been this: that facilitator influence can and does occur. The children are so sensitive to my thoughts that their messages can be distorted by my tendency to project and anticipate. If I remain blank, it is nearly impossible for me to keep the flow of communication going. It seems even more difficult if the person typing is hitting the keys independently while I am holding the device, than if physical support is provided. I am frustrated that the relationship between the person typing and the facilitator has not been studied. Researching the basic principles and limitations of the process is necessary to determine what is valid. We need to stop defining the experience of individuals with severe sensory differences in the context of our perceptual reality. A magnificent phenomenon is occurring; however, I feel the wrong questions have been asked. Concerns have revolved around 'who' the information is emanating from, rather than the 'relationship' that is occurring that allows for the information to be transcribed. How does this relationship occur? What are we to learn from it? Does it help the person with severe autism understand our language system? Does it help us understand their system of direct knowing? Please contact me if I can be of service. I have videos available fro viewing for qualified researchers. As a board certified behavior consultant and someone who has worked with children with Autism spectrum disorders for 13 yrs, I would be wary of FC. Yes, I have provide prompts for children to use communication boards, but always with the focus of fading those prompts. Personally, I wouldn't trust 90% of the communication coming out of FC. I understand the hype, but all someone has to do is look at the research on it, or do a blind test. there are methods of treating the behaviors associated with autism that have been supported by research... why doesn't CNN do a spotlight on those methods instead of supporting and promoting unsupported methods and preying on the fears/needs/prayers of parents of chldren with autism? We have a five-year-old nephew diagnosed with severe to profound cerebral palsy. I have been searching the internet to find somewhere to solicit advice on how to handle his use of the FC via his mother. At the age of two, this precious child was typing out amazing sentences, paragraphs, etc. but never concentraced on the flat, keyboard. He would look all over the place but where his finger was pointing. Moreover, if the family was laughing at a joke or something on t.v., his mother would (and still does) stop and have him type out on the FC that his feelings were hurt because he thought we were laughing at him. This child has now upgraded to a very small (6 x 6) keyboard that is a piece of paper laminated. We feel so sorry for the parents and their grief that we don't confront this or even question it. He has never spoken one word but his mother claims he can do advanced trig, reading, etc. He can barely hold his head up let alone sit up, crawl, or walk. I don't know what to do. I am looking for chat rooms, etc., to find people that can guide us in this very sad situation. 1) Profound CP doesn't necessarily imply cognitive impairment. Expressive language deficits do not necessarily equal so-called mental retardation. There are adults today with the same profound motor delays your nephew has, and some of them learn to use communication devices (like forehead or eye-gaze pointers) and go on to college. 2) The not-looking at the keyboard does raise concerns, as does unusually precocious language, but those are more warning flags than absolute indicators of falsity. 3) From the FC research, there is no question at all that facilitator influence is real. There is weaker evidence, but evidence nonetheless, that FC users themselves are communicating. Some of the best evidence for that comes from FC users like Jamie Burke, Sharisa Jopy Kochmeister, Sue Rubin and others going on to type without physical support. It seems highly possible that both external influence and authentic communication can be going on with a particular facilitator/user duo, even during the same session of communication. 4) If you seriously doubt the validity of the communication arising from your nephew when he is alone with other kids, one possibility is not leaving them unsupervised until your doubts are allayed. 5) The most empowering thing to do for any putative FC user is to help him or her become more independent. That is strongly encouraged by the Facilitated Communication Institute in Syracuse (e.g., in their training standards). You've got a challenging situation. It sounds like you may want to find a way to diplomatically express your doubts while preserving family bonds. What I would suggest is that you may find your nephew's parents more receptive to your concerns if you express them with a hopeful and positive note. You might encourage them to check out forms of augmentative communication that lead to greater independence. The technology that exists today is amazing, and it's a real blessing that your nephew is alive at a time when he has the opportunity to take advantage of it! "At the age of two, this precious child was typing out amazing sentences, paragraphs, etc. but never concentraced on the flat, keyboard." Some people have good enough visual memory or peripheral vision to type one-fingered without looking at the keyboard. I normally type one-fingered and though I look at the keyboard, I tend to look every few letters rather than every letter. If I don't look I type slower but still legibly. I do not use FC and I can speak well enough (I'm more of the Asperger type of autistic) that it's really obvious to everyone that my typing and speech confirm each other. Regarding the typing sentences when very young, he could simply be a profoundly gifted or hyperlexic child.